So, I am back in the city. Why? I ask myself that quite often, these days, and try to figure out how to get myself back home on the river, all the time. It is where my home is. The river is where my heart soars. Why is it that I have such trouble, settling? My excuse is that there is so much to be done, here. Gardens and lawns and outdoor work. Inside work, too. Things! When you own a house, you do things! I have to figure out if I want to sell this place, and if so, how to figure out where David will be, for the remainder of his schooling. He's doing so well. I hate to disrupt his study life. It's crazy, in a way, to care so much about my 26 year old son, but walk in my shoes for a while, and then you can have an opinion. :) (Just try to get your foot into such a skinny shoe! AAAA! They are a tight fit for most! If you can get your foot into that and walk for a month, I'll listen! Oh wait. I forgot. I need this place for when I'm sick. It is so hard to remember that I have times when I am sick and need to be close to the doc, when I feel "better". Hotels just cost too much. Also, when I'm ill, it's so nice to have David around. He helps me with everything and I appreciate him so much. At the very least, I can take this one off my bucket list. I've always dreamt of having my own home, and I did it! I like having my own home. There are times when I just walk down the hall and say, "This is mine! My house! MINE!" LOL. I can dig a hole there. I can paint this wall pink and white polka dot, if I want to! I can tear out a wall and put in another one, if I like! It's mine! If I could find a roommate, I could afford to leave things as is, and just be at the beach more. I'm working on that. It's so hard to find someone you trust as much as family and good friends. If you hear of anyone that wants to go to Clackamas community college and stay somewhere, let me know! I've done the foreign exchange student thing, but in order to do that, I have to be here, I've found. They aren't independent. It's almost like having another child. In fact, it is almost more work and concern. Thank God for David, again, as he did a lot of that work and driving around. I'm pretty much done with that, although I found the experience very valuable and really fun! I miss my "kids" a bunch! Well, lots on my mind. I'm going to leave it to God, I think. Let go, and let God. Isn't that the saying? I'm working on it! It's off to the puppy park! Oh, wait! I put the hats on sale that I bought for the show. I have to move this merch, and it was one of those things on the board that folks said they wanted, and never purchased. So, they are now at cost. Click here if you want one! Colored and camo. The camo are so awesome! I am a shipping fool! I've sure learned a bunch about shipping. I put the ifish hats from the show on clearance so that I can afford to buy the next bunch of things the ifishers want. That's sweatshirts, and camo hats with the pro-back. I'm going to do custom orders this next time, where you need to pay before you ship, so that I don't get left holding the ball. Like I said, I make mistakes five or six times, just to be sure. I read that on facebook a while back, giggled, and it's so true about me. I don't learn from just once! I'm still not ready to do that with the kwikfish, though. Those are custom and limited. Keyword: Limited! If I sold as many as people wanted, they wouldn't be limited, now would they? That's part of what makes this fun and what makes the kwikfish valuable to people, later on! Fun! Souvenirs! And what fun to have a collection of all of them! It takes some effort! I don't even have all of them! I wish I did! Unfortunately, I get suckered into selling mine, when someone special from ifish writes to me, saying he doesn't have one. So, I reach up in Grandmas cupboard, and make someone happy! Making people happy makes me happier than you know. It's fuel for my "feel good". So, it's actually a selfish thing to make others happy! I benefit from it more than they do! Oh, I love the sunshine! Don't you? I hear today is going to be really sunny and nice! Yay! I think the weathermen and women do this on purpose. They forecast a week of rain and actually know inside that this isn't true. Then, you are all set and ready for rain all week, and they sneak in a sunny day, just to make us feel better! Wonder how much feel good they get from that!? I don't know, but I sure like it! My garden is looking pretty nice! My lawn, too! Better than ever! I'm so thankful to my brother for coming over to both poke holes in the ground. (I forget what that's called) and then using a thatching machine to get all the moss out. Alrighty... It's off to the puppy park with Willie and I. He's so darn cute. He misses his push-ups on the river, but is doing just fine, anyhow! You didn't know I was a crossfit coach, did you? Click on the lower right to enlarge! Wow. This should really be my day! With ... let's see, how many ifishers calling me "Mom", I mean, wow! Happy, happy to me! Like the "Twelve Days of Christmas", I think we should start celebrating Mother's day and let it go on for at least 12 days! Just like "Birthday week"! My sister constantly reminds me that if there is something to celebrate, by golly, we are going to celebrate it! Mother's Day is one of those days! How come it is, then, that it always seems like "Mother's Day" is for my Mom? My Grandma? Certainly not for me? Having a bazillion members of Ifish calling me Mom is a fun but silly thing, to me! Not certainly a real thing! I'm not their Mother! But, "Happy Mother's Day" it is, and I do have two fine young sons. One is missing and gone to Heaven, but I still have him in my heart and always will. When asked how many kids I have, I still say "two." I don't even go into details like I did at first. I don't excuse it by saying, "One is in Heaven." I just say two and let it go at that. Going into details with a new friend is like putting a damper on a conversation. We can get to that later, if a friendship develops and it goes that far. But celebrate I do, and I have two kids! Mothers! We all have them! When I think "Mother's Day", I think of my own Mother, and how many kids she handled so gracefully. Thoughts fly through my head of how awful it was if my Mom was sick. She wasn't sick often. My Mother was heroic and strong and well. But, once on a trip to California, she came down with shingles and she was so sick! All five of us kids in an old green station wagon, back in the days when you didn't have to wear seat belts. We all had a small place to sleep while my parents drove in the night. It was so uncomfortable, but we made it work! We didn't think a thing of it. When Mom got sick, she needed to sleep in back, with us. That was horrible, not because of the lack of space, but because it impacted us just how sick our Mom must be. Mother's are to be held in praise, to be looked up to, and know that they are well and strong and like I said, heroic! The two times I remember her being sick were just awful. Shingles, and another time, when she had surgery on her varicose veins. She lay on the couch in the living room, and I remember her being in pain and moaning. I felt like "That's not my Mom!" Such a lost feeling! Thinking back, it makes me wonder how my own children felt, when I have been so awfully ill, and they walked in to see me with all those wires and tubes all around me. If it made my brother cry, what did that do to my kids, who were then barely 14 and 15? Losing your Mother brings grown men to their knees in tears. I've seen it so many times, reading the ifish forum, or getting private messages from otherwise big, strong men. Being a Mother is such an important job! Like it or not, Mothers need to take ownership and the responsibility of the title! If you are a Mother, and think you are strong, weak or otherwise, the people you Mother count on us, so heavily! Be strong, even when otherwise! I need to take the role of "Mom" on ifish seriously, as people count on me to bring order and peace to the board. But, more importantly, my son counts on me to be well, to do the best I can to overcome my health challenges, and to smile through even the roughest of days. What is it they say? "Happy wife, happy life?" and "The Mother is the emotional barometer of the family"? I believe in all of those things, as I was a child before I was a Mother, and I know the impacts that it had, both when my own Mother was ill, but mainly when she was well and happy! Everyone was happy most of the time, because my Mother was happy, most of the time! So, be well, all you Mother's out there. Even in the most difficult of family relationships, a Mother is held high and respected, no matter what. Oh, but what a huge impact you can have on your family, by something as simple as a smile. I find it kind of like the Grace our Heavenly Father shows us. He loves us, no matter what, and like wise, a Mother loves us, no matter what! A child looks up to a Mother, and forgives any sin that we might commit. Children think their Mothers are all powerful and will be able to overcome any illness, and stand strong through the most traumatic life events. I suppose that's why that when Mom goes home to be with their Heavenly Father, that it is so tough on everyone. Totally unfathomable! Unbelievable! How could my Mother, the one who was so strong and always there for everyone, be gone? Gone?! The balanced mobile that was your family, now hangs wobbling in the breeze until it finds its new balance. Honor all Mothers! Tell a story to someone about a special Mother in your life! Love them and honor them! Take this day and make it so much more than a Hallmark Holiday! I really don't like that old whiny statement that life is hard, but dang it, it does seem to be! It is a constant adjustment ... adjusting to each new season in conjunction with the life or death of family and friends and ever-changing relationships. Divorce, squabbles between friends, etc. As Spring bursts forward in grand floral blooms, my fond memories that go along with this new season have so many associations with the people in my life that I love and have loved. Many of them aren't here, any more, so, I've been asking myself how I can retain and enjoy those memories, without the associated sadness, feelings of loss and grief!? It is a daily fight to retain that joy, and I refuse to think it was buried in a grave with my loved one. I remember back to waking in the morning in Spring and having Andrew say, "Mom! Mom! Smell! It smells like Spring!" And I smile to myself, but then that old sadness hits. I want the joy! Not the sadness! So, I am adding this to my will, in an effort to let people know it's OK to be happy! -and I know full well that my friends and loved ones would have done the same, had it occurred to them. That is part of why they were my kind of people! I will to my dear friends and family members the joy we jointly experienced in each new season. Thus, when you have a memory of me that is associated with the first snow in winter, the first bloom of a crocus in Spring, or the wonderful feeling of padding barefoot together through the lawns wet dew on a summer morning, I leave you the most important facet of life that we experienced together. JOY. That feeling you get on Christmas Morning, or the night before... The magic in life! Keep it. Remember it. Experience it, and share it with new friends and family. Pass it on and leave it to your heirs, in turn. Just like you would not take your physical belongings to the grave, or be buried with jewels and cash in your pocket, I think you will agree that it is selfish to take the joy you shared with others when you go. And all you heirs, take it along in your life, without guilt. Share it! Enjoy every memory of every smile, every discovery and every giggle with glee! Spend it with wild abandon, without second thoughts! The happiness you share with those who leave us and those we leave behind is not only a gift, but a responsibility to take and to share with others, so that they may in turn, pass it on. There is no beneficial reason to feel sadness over joy. Choose the latter! Joy! And pass it on! Funny. I had David read this, and he put it down and said, "Oh, Mom! That's nice!" I smiled and he continued, "But..." and he sheepishly continued... " Mom? The part that we talked about before... the house, the money... is that still going to be in there?" Ha! He cracks me up! I think I'm going to really freak out, when it comes to insert "June" in the blog, here. June? I feel like I'm in some kind of time wharp wonder. I mean, how did June happen when yesterday was October?! Now, now, now! Now is the time to start Christmas Shopping, and by golly, I'm going to do it! (I say that every year!- haven't done it yet!) Just once, I want it all done by July! Yesterday I was driving through town coming home from the docs, and thought to myself, "Soon, there will be a fireworks display in Fred Meyers parking lot." and giggled. Oh, how close that time is! Now is the time (no, passed time) to start tucking away money to pay your property taxes! Now is the time to get rid of some of those winter clothes. Not just put them away, but to get RID of the ones I don't wear! This is why I never get anywhere. Time just goes too fast! June? Nah... Not really! It couldn't be June! I know one thing for sure- Now is the time to go Springer fishing at the coast, and I mean it!!! But... this is my excuse, and it is a good one. A good one, like all others. I arrived at this beautiful sanctuary, the wonderful zen-like "good chi" home on the coast on Tuesday. I felt pretty good on Tuesday. Just tired. Willie and I romped and played on the river beach in the sunshine. It was really nice and very refreshing, but yes. I was tired and it was really warm out! Beautiful! That night, I ate dinner, did Willie's final walk and went up to bed. I felt weird. This bizarre feeling of wanting to stretch my body, and like "Bam!" I got really cold. Frantically cold! Just by chance, I took my temp. 103?!? No way. Took it again. 103.3! "Bill? I'm sick!" It was a shock to both of us. Just an hour before, I was out playing with Willie in the sunshine in shorts and a tee shirt! I took a couple aspirin and took a nice hot bath. (I know, bad me.) Mind you, it was probably 85 upstairs in the house, and I was cold! Even in the hot bath, I was cold! Bill helped me get out, because I was so weak! The next day I was pretty sick all day. But, that night was horrid. I was one sick chick. Temp was still 103, and I couldn't sleep for the life of me. My chest was clogged. You know that feeling of having a brick in your chest? Yeah, that. My nose was stuffed, my ear hurt, and I just lay there, cold, but sweating, and then hot, and sweating. I was really disoriented, too! I had never felt that weird! Sweated through the sheets and through four pairs of pajamas! Yucko. I needed a doc, so a doctor I did go. At the docs, my temp was (get this!) 96.0! The fever had broken! Then, I started to cough in the office, and I coughed up... (get this!) blood! Was it blood from the transesophageal echo, or what?!? It freaked me out! The doctor didn't seem that alarmed. Mumbled something about coumadin. So, I went home with antibiotics, and today, Friday, I feel alright. I slept like a baby last night! I wonder if I just had some kind of weird virus? If so, then why the antibiotics? Whatever, it was no fun, and I wouldn't wish it on anyone! Tomorrow, I'm going fishing, darnit!! Come heck or high water! Bill and I are going FISHING! We have this new security feature where we can watch the house. It will be fun to watch the dogs, too! Wow! Would LOVE to see the Orcas in Tillamook Bay, but I doubt Bill's boat would be comfortable out in the bay. Maybe? Maybe we'll try it! But, watch the video feature on the right, there. I guess it has happened before, but wow! Just wow! I want to see the Orcas! It makes me feel like an excited little kid! Let's go! I think I'll take my good camera out, today and take some pictures of some birds, and all the pretty wild flowers. Can't wait to get back to Oregon City and see if my Hoods are ripe. (Strawberries). I was so excited to be able to grow my own Hoods. For the last umpteen years, living at the coast, I've driven the coast hiway each Spring each year, in hopes of catching the people selling Hood Strawberries, either before they've sold out, or before they are gone, all together! They just don't hold as well as other strawberries, which is why they are so sweet and awesome! In town, here, we have these ladies that are referred to as "the berry ladies" that wake up in the middle of the night, each season, drive to a field and pick the Hoods and bring them for sale at the Farm store on 101. I always pray I catch these dear ladies, too! It only goes on for like a week or so? Maybe two? So, I bought some plants, and my largest raised garden is now totally over-taken by Hoods! YUM! Earlier this Spring I was going to thin them, to try and fit in my squash and other veggies, but when I went to do it, they already had green berries on them, and there was no way I could kill them with berries on them! Green or not, those plants were staying! I can grow veggies somewhere else! Next year, though, I'm going to do my best to thin them to an appropriate plot, and make them stay where their space was allotted! Our Violet-Green Swallows are so beautiful! I enjoy watching them so much! There is a little house, adjacent to my office window that they fight over, each year, and watching them raise their families is a real treat. 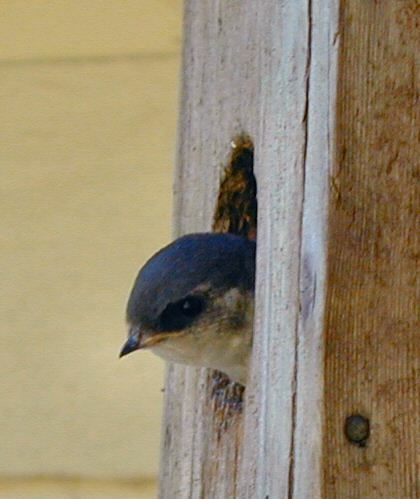 It's so nice to pull in the driveway and be greeted by Mom, poking her little head out of the hole in the house! Not a great picture, but they are so dark in that corner, and I just don't have the appropriate skills to capture much better! I was looking at Marie of Tillamook Baits bird pictures on Facebook! Man, they are beautiful! She posted a pic of a Northern Flicker and I can't find it, anywhere! She is doing very well with her camera! Well, it is off and about for me, today. Bill is busy tomorrow, but it's fishing on Wednesday! I'm finally coming out of the woods from whatever illness I had. Still weak, but getting better? I hope? I'm tired, today. Thank God I'm not sick any more, though! That last one was a doozy. I had fun, yesterday! Look what I made! It was fun putting together! I bought the base at Michael's. 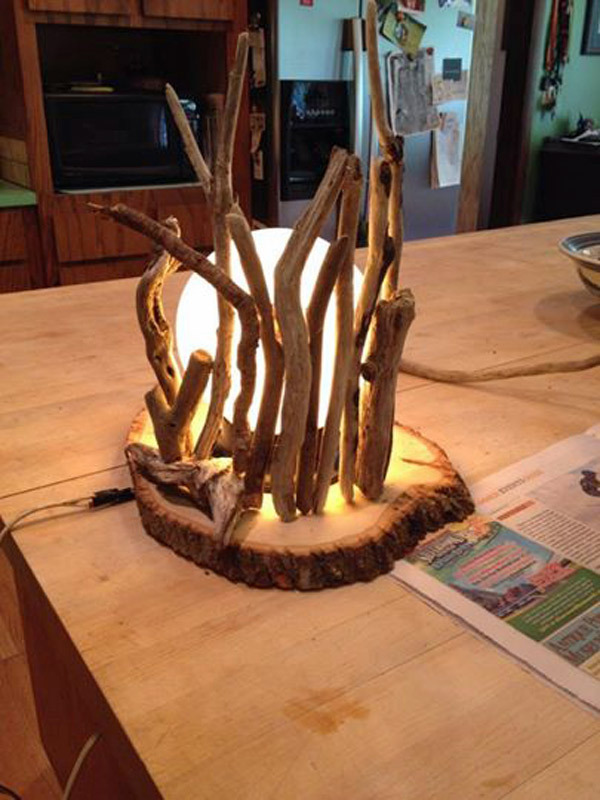 Then, Bill bought a small ceiling fixture for less than 10 bucks at a hardware store. To get a yellow look, like the moon, we put a yellow bulb inside the globe. 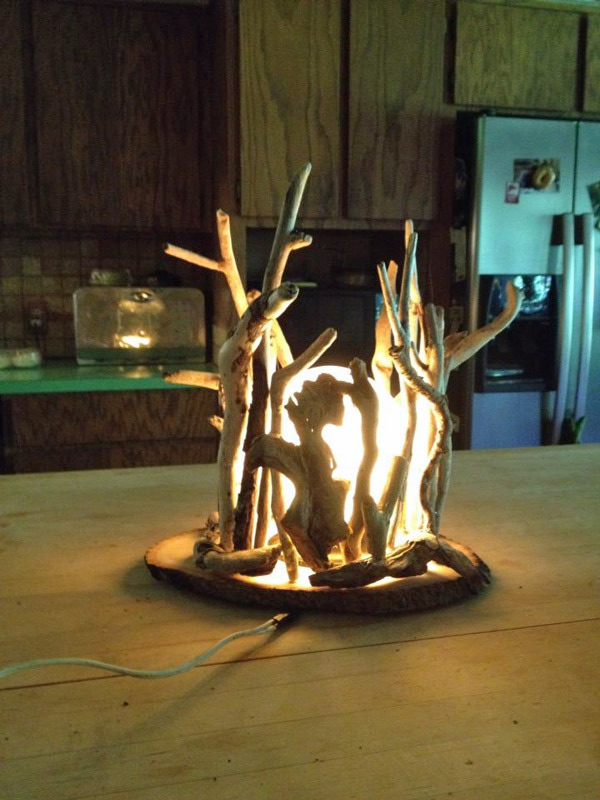 Then, I simply got out the glue gun and went to work with the driftwood I collected, both at Garibaldi bay beach, and out back! I found it a little wobbly, so we glopped on some wood glue on the inner side so it doesn't show. It's kind of like a jigsaw puzzle, fitting the sticks together to brace the entire thing. I used a coffee can as a mold. I wrapped it with waxed paper, so that the glue didn't stick to it. I can't take credit for the idea. I found one sort of like it on Pinterest. I just thought it was so pretty and thought, "I can do that!" And I did! It was such a feel good thing! I haven't done artsy craftsy things in a while, and forgot the joy it brings. It was one of those things that actually made me jump up and down and clap! You know, like when it snows! Or, when you catch a big fish! That kind of fun-joy! Off to the city, today. Do I take the lamp with me, or leave it here!? I guess I need another one! I can't wait to see if my Strawberries are ripe!!! Wow. I feel good! I feel like it's been ages since I've felt good, but I have been doing well for about 3 days, now, and it kind of scares me! I'm enjoying it so much! I have gotten garden work done, and grocery shopping, and internet work! Go, Jennie, go! I feel like I was sick most of the winter long, and now that Spring has sprung, well, things are looking up! It's so nice... let me tell you just how nice it is to go out to the garden for a fresh Hood Strawberry! Whoo! I just love it! They don't get ripe fast enough for my appetite, though, and I feel kind of guilty not sharing them with my roommates! I wonder if they are hunting them in their spare time, too! Well, you know what? I think the early bird gets the strawberry! I'm out there way before they get out of bed, so what's fair is fair! There is nothing as exciting as parting those green leaves and seeing their bright red goodness, just waiting to melt in your mouth! I'm headed out there, soon! I've been planting my garden, and keeping it fairly weed free. That's such a chore! By the time that you get everything done, in raising a garden, is it worthy of your time? Are we saving money? No, and no, probably, but the taste and the goodness is worth every minute and every penny! This next week will be dedicated to fishing the bay, getting ready for the tournament, "Bounty on the Bay". Bill and I enjoy that tournament the most of all, I think! You can find out more about it, here. Please download the PDF document, here. It's the tournament that I learn the most about fishing Tillamook Bay for Springers. Between chatting with the other folks at the banquet and pre fishing and listening to the talks, you'll pack in a lifetime of knowledge in one weekend! And yet, each year I learn more! Bill and I will be fishing in his little duck boat and that will be a kick! Just enough room for Bill and I and the salmon! Whoo hooo! From their website, "This annual fundraiser supports TEP’s efforts to implement the Tillamook Bay Comprehensive Conservation and Management Plan (CCMP). Over thirteen years in implementation, the CCMP establishes 63 scientifically based, community supported actions that restore water quality, enhance degraded habitats, reduce sedimentation and lessen the impacts of coastal flooding." So, join us! There is still time to fish on your own. I don't know if there are any guided seats left, but come on down and fish in the tournament! It's so fun! Oh my gosh! Meet Ruger! I nearly put him in my car and raced away! Such a doll! 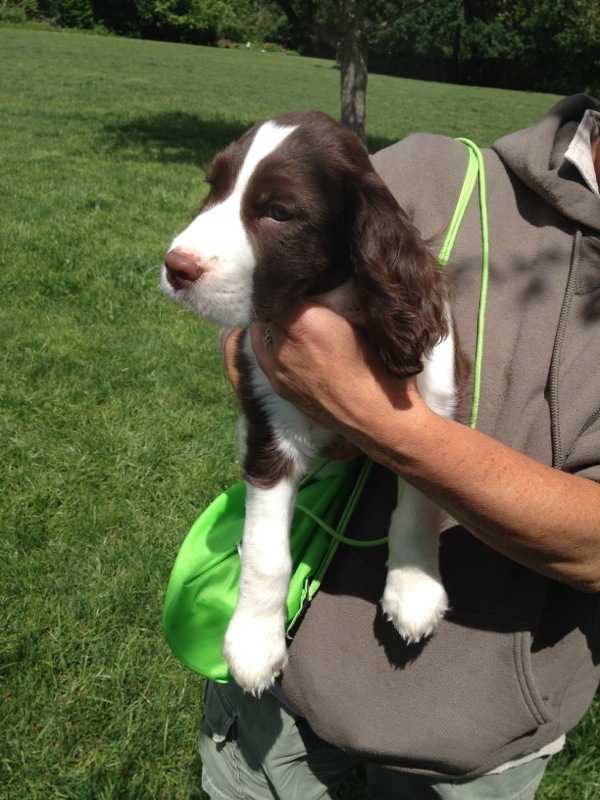 Eight weeks old, and from Springer Spaniels of McCormick, where my sister and my nephew both got their springers! They are such beautiful, well behaved springers with such good temperament! And oh, the wonderful puppy breath! Intoxicating! They have those 8 week old springers trained to do things at that age! I mean, it's amazing how well she does with her springers! I almost bought one from her but it's just too much money for me. That is, until you actually SEE one. Then, all trace of intelligence leaves you, and you hand out your credit card. I know I would do that! I would! Willie is beautiful and all, but man oh man is he a wilders! I almost feel like I deserve one of these puppies for making it through the worst of Willie's wilder years! The owner tells me that Ruger is just the best puppy. Never gets into trouble or tears up the house. When the owner sits, the puppy sits. When she rests, the puppy rests. Ruger can do no wrong. And... (oh no!) they have puppies for sale, still! Oh, no! I met Ruger first about five days ago at the puppy park at Mary S. Young. Since then, Ruger has filled my mind with love and questions. Why am I considering a puppy? What's wrong with me? And why, when the adoption kennels are full of puppies and dogs and kitties with no home, would I consider purchasing one!?!? That is not like me! Yesterday when I was there, I asked a friend who was there and met Ruger the first time, "Seen Ruger?" "Nope." Just then, they pulled up! "RUGER!" and he ran to me like we were old best friends! That little bundle of puppy breath tumbled towards me, all feet and all smiles! I'm a sucker for a Springer puppy. That's for sure. I am weak at the knees and I act irresponsibly. Yes. Had I been given the chance, I would have taken that puppy home, no second thoughts. I begged to be their puppy nanny. I promised to take good care of him, and that I wouldn't steal him. I'd just baby sit, any time they needed. I encouraged them to take a vacation, just so that I could have him for a little bit! I think she thought me a bit nuts! OK. It's off to the Bounty on the Bay. Springer fishing hasn't been great the last week, but you know what? Bill and I are going to win the "big fish" contest! I just know it! It's about time we won, so we will! Oh, and hey-- Do you know where McCormick Springers reside? Wouldn't you know, my strawberries are almost ripe. David and Tammy will get to harvest the crop. I hate that! I waited every day for them to ripen! I even ate some that weren't quite ripe, just to taste them! I'm coming back to O.C. as soon as I can, just to get my berries, darnit! Oh-- Please say a prayer for Andrew's kitty, Sargie. He is sneezing, and it worries me. Thanks! I mean, how could we both be so wrong? So entirely wrong?! How could we talk to friends in the know on the phone before hand, how could I write about it on ifish's front page, and not be questioned by anyone? Paranoia aside, (A bit) but was this a joke played on us by our dearest and nearest fishing friends?! Or, wha?? Bill and I had planned so carefully. Thought it out so critically. Timed it so specifically. I had come to the coast, despite not getting everything done in Oregon City, specifically because of the tournament. We didn't get to pre fish as much as we had planned, due to a crunched schedule. Despite it all, on Friday, we woke in the morning and decided instead of pre fishing for the tournament, we were going "report" hunting. After all, the most important thing in successful fishing, (in my opinion), is being dialed in. "Dialed in" usually means daily fishing. Learning by doing. Since we hadn't fished ourselves, by golly, we had to get the info, somehow! Used to be we had a circle of cell friends to call, but we just aren't dialed in like we used to be. Knowing that you have to give info to get info, we realized that what we'd get would be skimming the surface of the truth. :) But, still, we persisted! Partial truth is better than none at all! Off we went, in search of reports. We had one day (ONE, mind you!) to find out what was happening before we fished in the tournament! We had our work cut out for us! Lucky for us, when we arrived at the take out, the wind was up and was pushing most of the boaters off the water just as we pulled into the lot. There were lots of people to talk to! Lots of boats to watch, to see if anyone held up any shiny, big, springers to take pictures of, etc. We traveled from the 5th avenue take out, to Memaloose, to Garibaldi. We found friends and neighbors and thankfully, got some really good information. All in all, we decided that we'd fish without a boat! The wind just looked nasty, and if that popped up on the big day, it would cut our day in half. We don't have the big boat anymore, so we knew that the wind would just kill us in our little boat. We knew where we were going, and we were settled on a plan. I'd never entered a tournament where we'd bank fish, so this was a first! I was excited! Oh-- By the way, we were also testing a new camera setup I have at home to watch the dogs while we are away. A dog spy cam! Willie has separation anxiety, and I'm afraid to tell you that I do, too. I'm not sure who has it worse. While we were gone, we were also spying on the dogs to see how it would be when I left them to fish, all day the next day. We have this one chair that we never allow the dogs in. They are well aware of this. But, sure enough, the entire time those 'bad doggies' would take turns in the naughty chair! We watched them on my iphone, and when they'd get in that chair, we'd call the home answering machine and yell through our giggles, "Get down, Revvie!" (Or Willie, whoever was the bad one!) What a kick! They would get down, too! I'm sure they were plenty confused, though! So, Bill and I went home with our plans, and rested and readied for the pre fishing dinner, that night. We talked, we planned. What kind of clothing, what rods, what lures, what bait, and what time the captains meeting was, that night. I took a short planned nap, and had trouble waking up, until Bill tickled my feet! That is NOT a good way to wake me up! I got dressed. We checked the scheduled time, again and again. 5:30 PM. We had plenty of time! I dressed, asked Bill repeatedly if my casual look was OK. Wore a western belt that was too tight, but that I loved. Bill had bought it for me years ago, and I just never got around to wearing it. It's stiff and a bit tight. It's meant for jeans at the waste, and all the jeans now days hit me at the hip. We were set. I planned to go home early, due to not wanting to leave Willie too long at home, alone, and knowing that I'd also be gone most of the day, tomorrow. So, we took separate cars. Having gone to this tournament so many years in a row, I knew the schedule. It was a casual dinner, and the silent auction items would be out. After dinner, they have a speaker to talk about tips for fishing Springers. I would just leave after dinner, the first night. Bill would stay for the lecture and then give me the info he learned. Bill isn't a late sort. He was in a hurry. I was trying to keep up with him, so that we could walk in together, at least! Things just went wrong for me, though. I forgot this and that, and I was just hurried and harried! Bill wouldn't wait up! So, I ended up pretty much chasing him down the hiway! Finally, we pulled up at the Old Mill in Garibaldi. It was 5:40, and the event was planned for 5:30. Right? We had checked and re checked the time, before we left. But-- No one was there. The place was deserted! I rolled down my window. Bill said, "Maybe it's at the other building, this year." We drove around in our separate cars to the other buildings and met in the middle. I grabbed my iphone, and looked up the link in my column, below, to find out what we had missed in our planning. Was it at the Swiss Hall? Shilo? I read it out loud, boldly impressing the time and location in my vocal inflection. "Friday, June 6th, at the Old Mill in Garibaldi." "WHAT?" Bill repeated. "June 6th!?!" It took me a few seconds to realize that this wasn't June 6th!!! Now, wait a minute!!! I had asked Bill four times in the previous weeks and months, when this tournament was to be. I depend on Bill for this type information. He is my fishing schedule keeper! Even though I had linked the information in my column... Even though I had provided it for all of you, I hadn't read it myself. The fact is that the tournament is next week! I immediately took my belt off. Ah, comfort! "Meet you at the Dairy Queen!" I laughed and led the way. We got to the D. Q. and decided instead to go to Fisherman's Korner, on the bay, there. Earlier in the day while report hunting, we had both mentioned that we hadn't eaten there in quite some time. It was so good, and we ended up having lots of fun and laughter. I had the coconut shrimp, and he, the famous fish and chips. Well, we are ready for the tournament, next week! You know... on June 6th!! !